If you watched our House Hunters International episode you will know that I’m a bit obsessed with having indoor and outdoor play space everywhere we live. 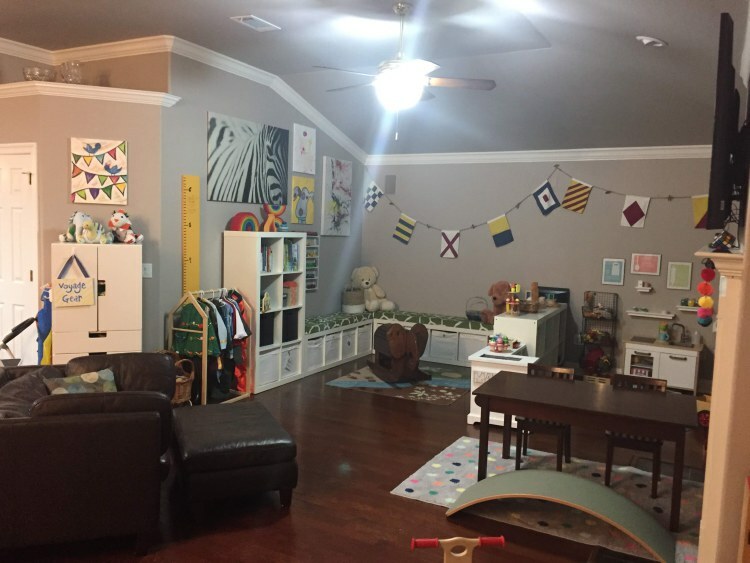 The Playroom at our current house takes up the largest room in the house because child development specialists have shown that kid space is an incredibly wise investment. 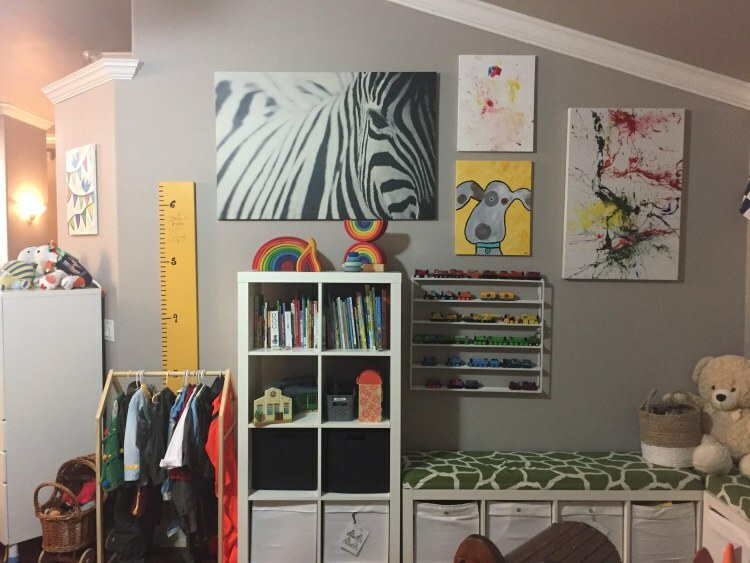 The kids make up 3/5 of the family and need the most space so we gave it to them by turning this room into the perfect place to live and play. This room is in the back of the house, so I never feel like it has to be perfectly clean as unannounced visitors rarely find themselves to this part of the house. 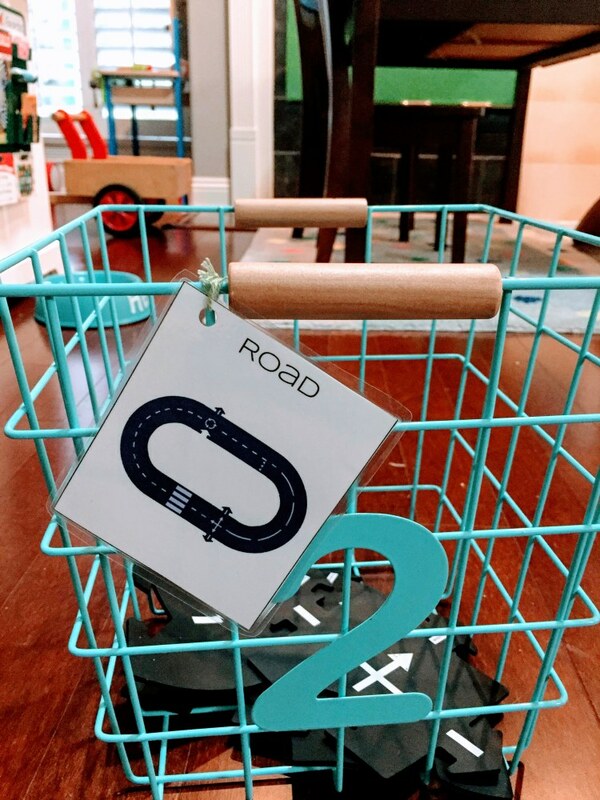 The playroom is part of the kitchen and dining room space, so these tend to be the most used parts of the house. The first hurdle to using this room as a playroom was the mounted TV. 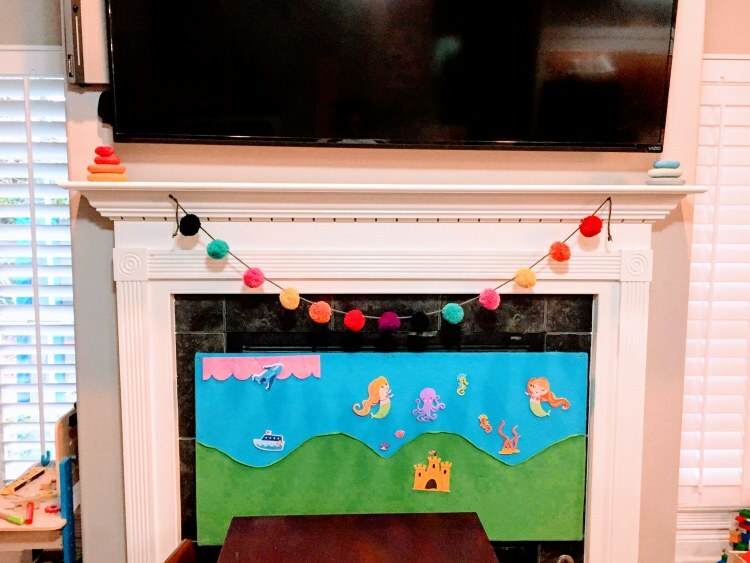 The previous owner left the TV mounted above the fireplace and when we tried to hook everything up we ended up with cords everywhere, not something appealing in a room with small kids. I looked at a variety of options for solving our cord and crowding problem and finally settled on Hide It Mounts. Hide It has an option for almost anything you might need to hang up. 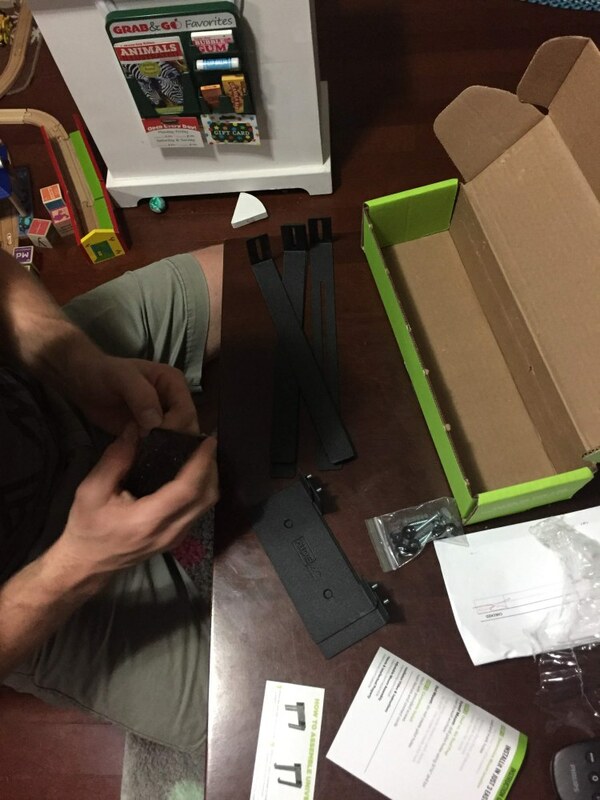 They are simple to install into the wall and hold all your hardware behind or adjacent to your TV. 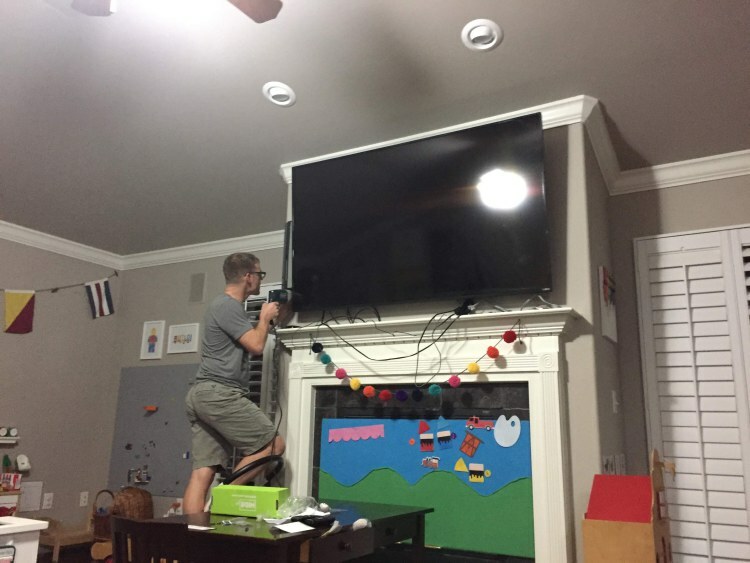 We were left this TV and were super nervous about taking it down or moving it around too much since we are not sure how the mount was installed. 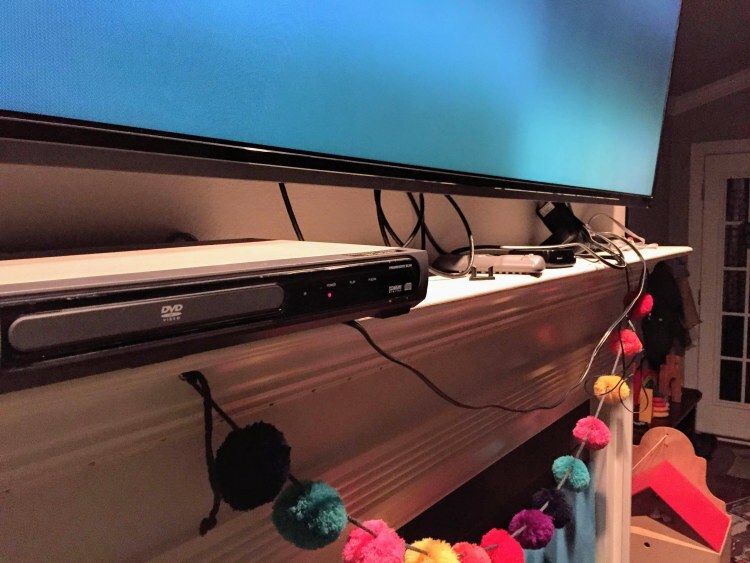 Instead Jeff was able to use the Hide It Mounts while the TV was still on the mount. We hid the Roku, ancient DVD player and Wii. Once Jeff installed the mounts, I unplugged everything, tagged and bundled the cords with cord straps so the wires fit nicely behind the screen. 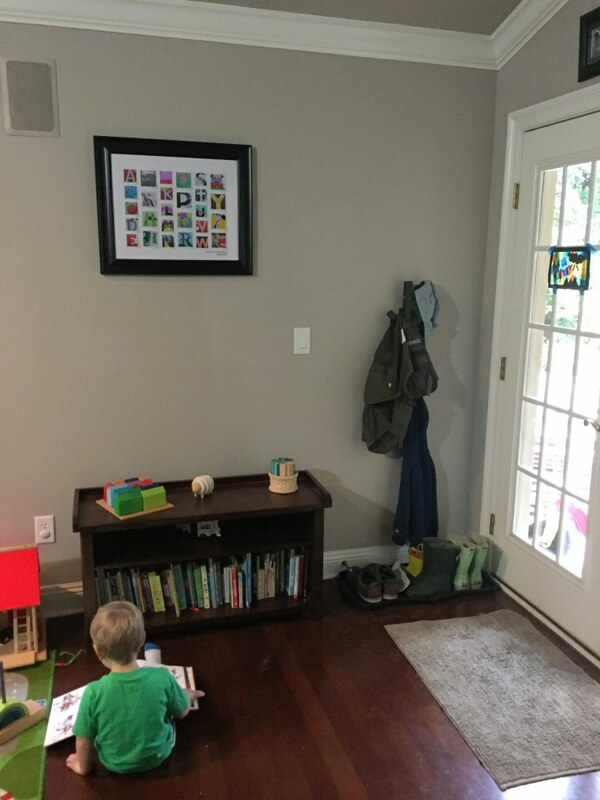 Getting all these gadgets off the mantel made a huge difference in the look of the playroom. With the mantel all cleaned up we went about organizing the rest of the toys in the room. The goal was to let all the toys have a home while also being accessible to the kids. If you’ve clicked through our Dutch house tour or seen our episode of House Hunters International, many of the things in this playroom will look familiar. The rocking elephant was built by my dad for me when I was little and has made several moves with us. Jeff lined its rockers with felt to avoid scratching the floor. It is magically transformed into so many different things over the course of the week. Every basket in the room has a label with a picture. 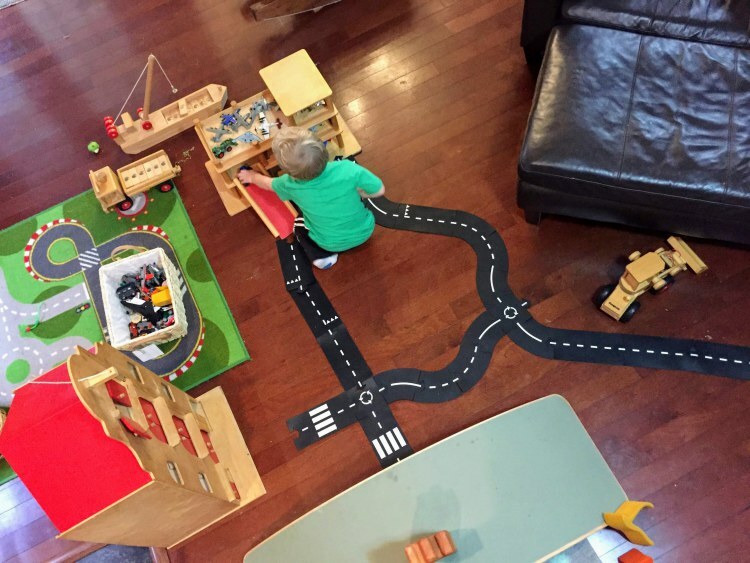 Yes, this helps the littles clean up, but it also helps my husband, babysitters and visitors who are here to play. Since labeling the baskets, things are more often put away. The shelf/seating was built by Jeff back in Colorado and has miraculously fit perfectly into each home. 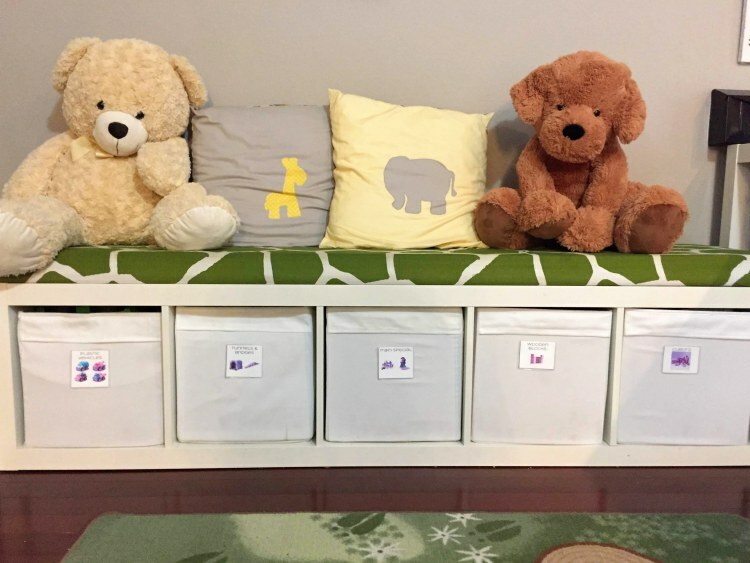 It’s an IKEA hack based on this one from the I Heart Organizing blog. I made and laminated the labels and attached them with velcro dots. This makes them easy to switch out as we grow out of toys. 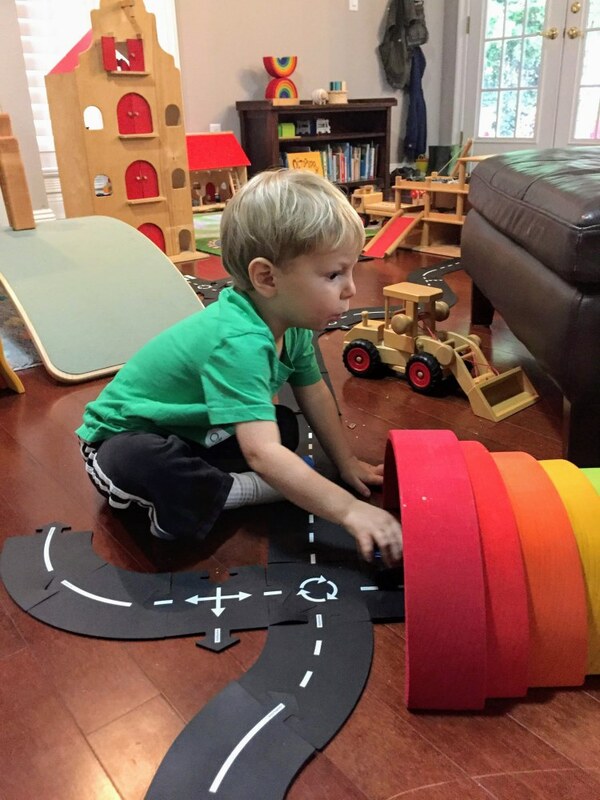 We move the rocking elephant out of the way and this space is just perfect for playing trains or cars with larger set ups. 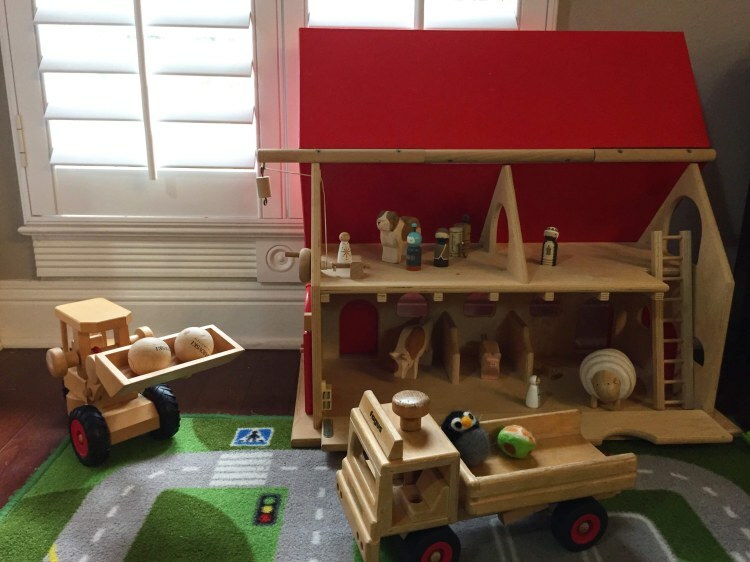 The playroom is largely out of the way, in terms of the flow of the house, so toys can be left set up for a few days. The dress up area is also on this side of the room. The accessories (hats, glasses, accoutrements) are all housed in the cabinet. The most used dress up items are hung up where the kids can see them. Towards the end of our time in the Netherlands I had moved the dress up clothes into a cabinet to keep things looking tidy and they were never used. In this house they are back out in plain sight and are part of daily play. 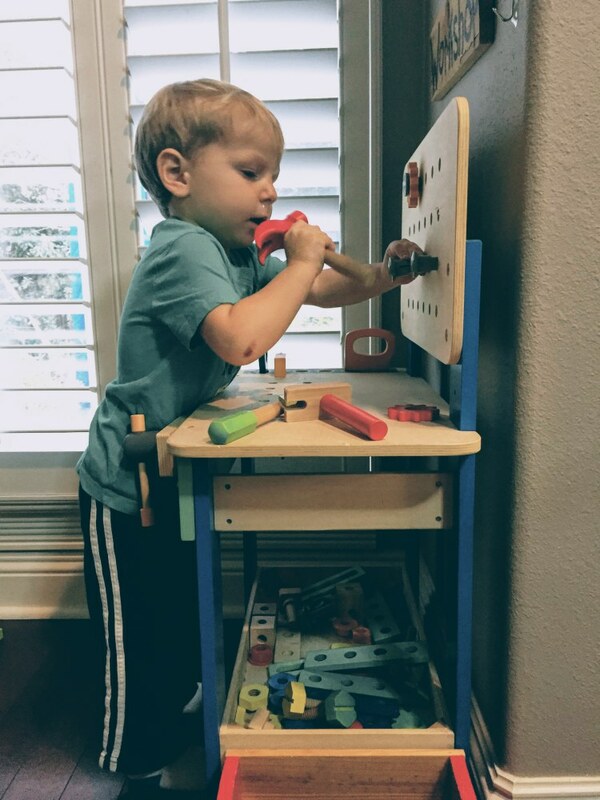 My kids love the play kitchen! (Ours is from IKEA.) I’ve always struggled with how to store the food so that it is played with but not all over the floor. These wall baskets attach to the wall and provide plenty of storage for all our food. The kids can easily toss the play food in them during clean up. I can exercise my OCD by sorting the bins into fruits, vegetables and grains. We do not have the IKEA top and apparently you can not buy it separately anymore. Instead we hung a few floating shelves that had a previous life in the boys’ Colorado nursery. 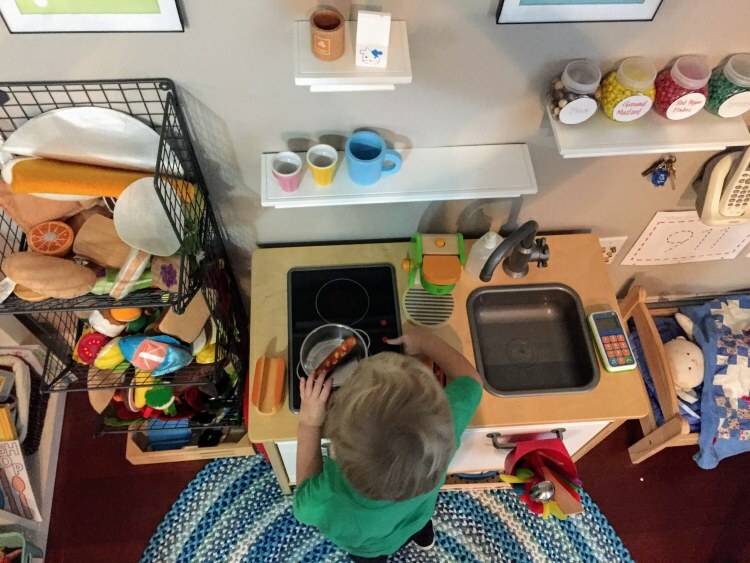 These little shelves are perfect for holding the cooking items the boys are using the most. We also hung a command hook for keys and an old phone. I added the doll bed to this area as well since the boys loved bringing their dolls over to play. 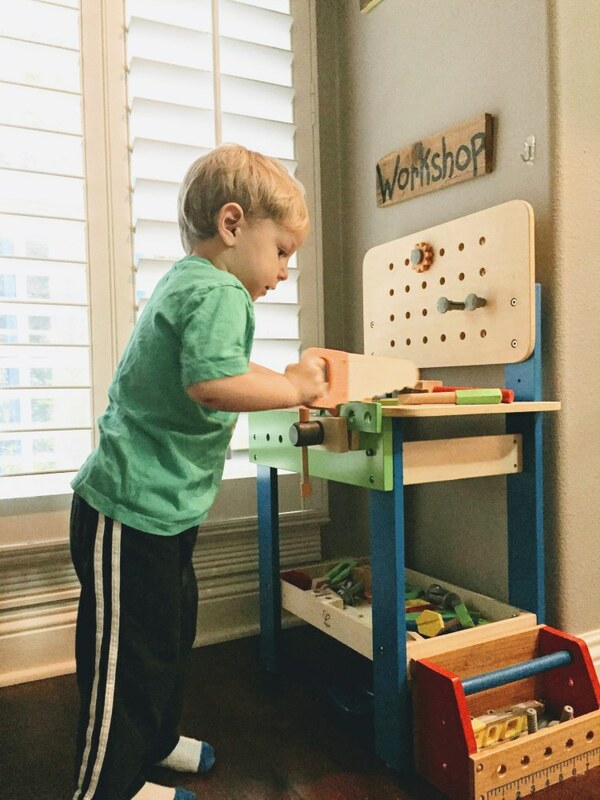 The boys are all able to get nails and screws in and out of the holes on the workbench. We have picked up a few accessories for this area, like the tool box, a level and a measuring tape, from the thrift store. We knew we wanted to add a Lego Wall into the playroom. We saw them all over Europe and our kids love them. 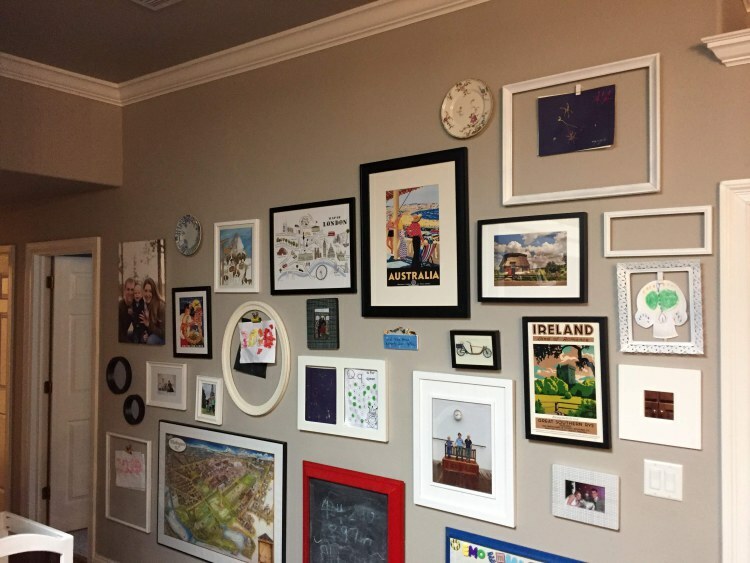 We’ve been amazed with the creativity on this wall. We used these Brickyard boards to build the wall as they allow the boys to put both Legos and Duplos onto the board. 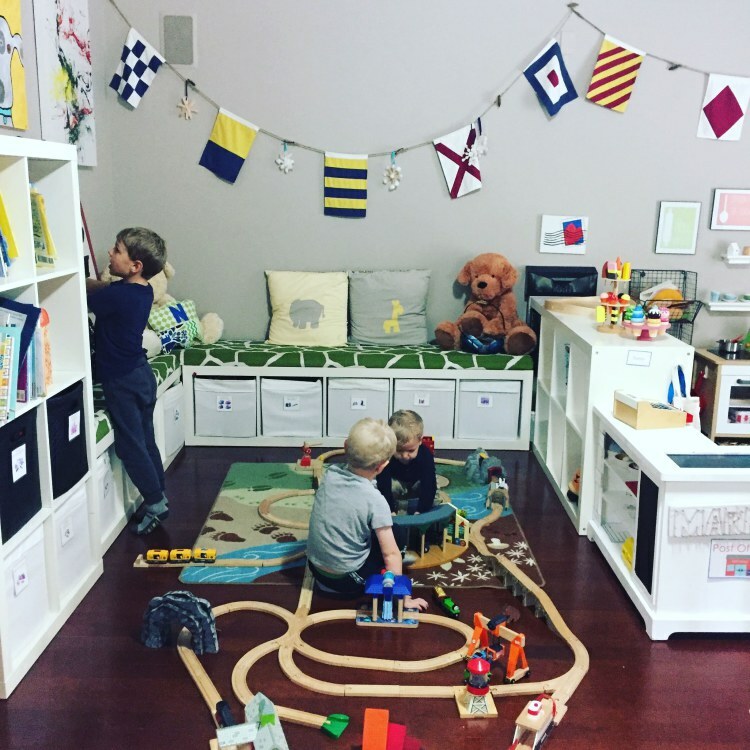 The last corner in the playroom is by far the busiest. The boys’ favorite toys live here. This is a collection of doll house toys. We have a canal house, a barn and a parking garage that make up the basis of this area. The cars, trucks, felt dolls, peg dolls and wooden animals all live over here too. The boys build all sorts of things in this area. Sometimes they even run over into other areas of play. This is by far the busiest area of the play room. The playroom has a door leading out to the patio. We typically don’t wear shoes inside so I put a little shoe stand by the back door as well as a clothes hanger. The hope is to catch the hats, vests and coats as they come in. 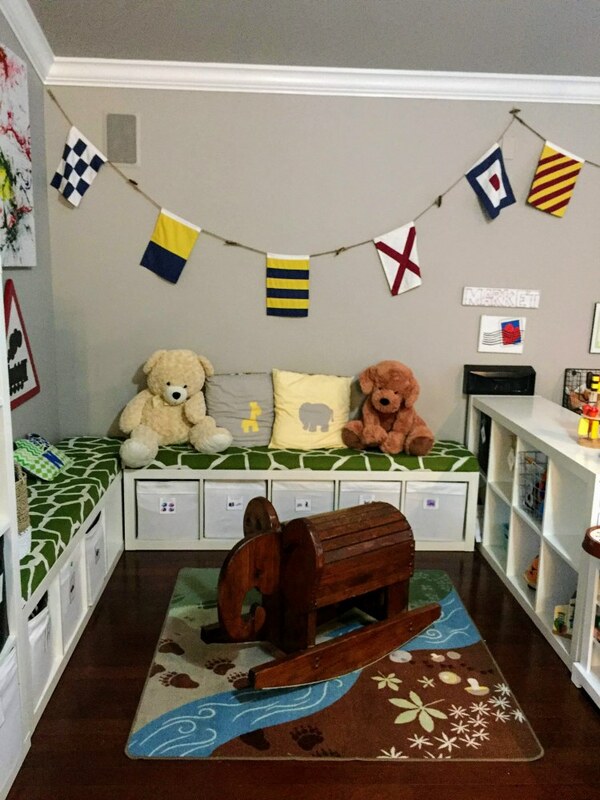 I used our old shoe bench to hold books and display some toys. (Displayed toys always get more use!) We can also use the bench as needed for putting on shoes or taking a moment out from play. 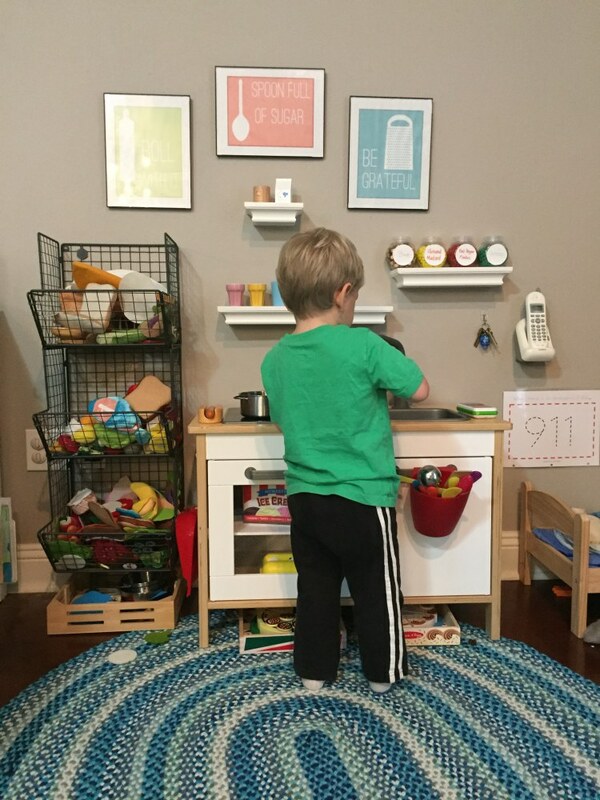 The largest wall in the kitchen can also be viewed from the playroom. It is in the crossroads of the house. We designated this as our art wall. The bottom layer has a magnet board and a chalkboard for the kids to play on. Then there are a mixture of family pictures, our children’s art on display and posters and souvenirs from our travels. The plan is to go all the way to the ceiling, but I’m still working on that project. The pantry happens to also be right in this area of the house. The kids were constantly running in there with toys to play or attempting to sneak a snack. In order to put an end to that I used the 3M Guardian Stick on Safety Lock. This lock can be locked in the open position for normal use of the pantry door. My mostly trustworthy six year old can open the door to get himself a snack or something he needs. The lock prevents my two and four year old from entering the pantry unsupervised. The lock has been a good reminder for the whole family when we stop snacking an hour before dinner and again after dinner is over. 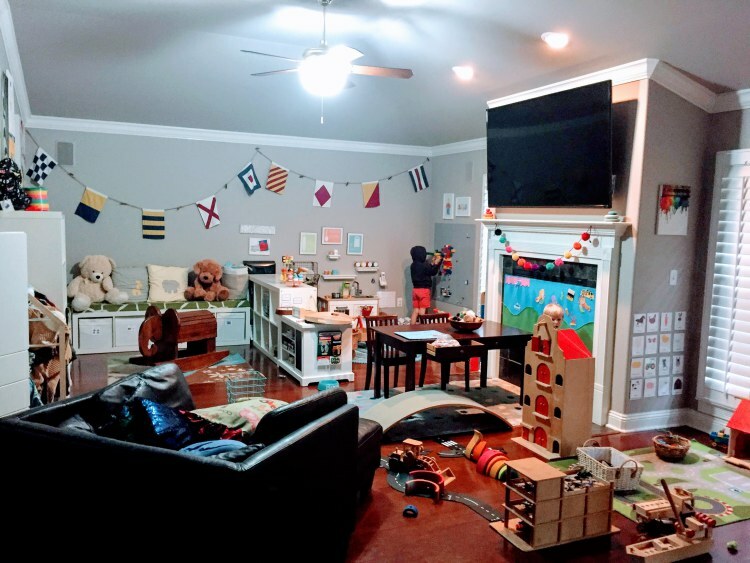 Lest you think my playroom is always neat and tidy and photo ready…it is not. The boys love and utilize this room, which means it’s usually a huge mess. We pick up every night before dinner. 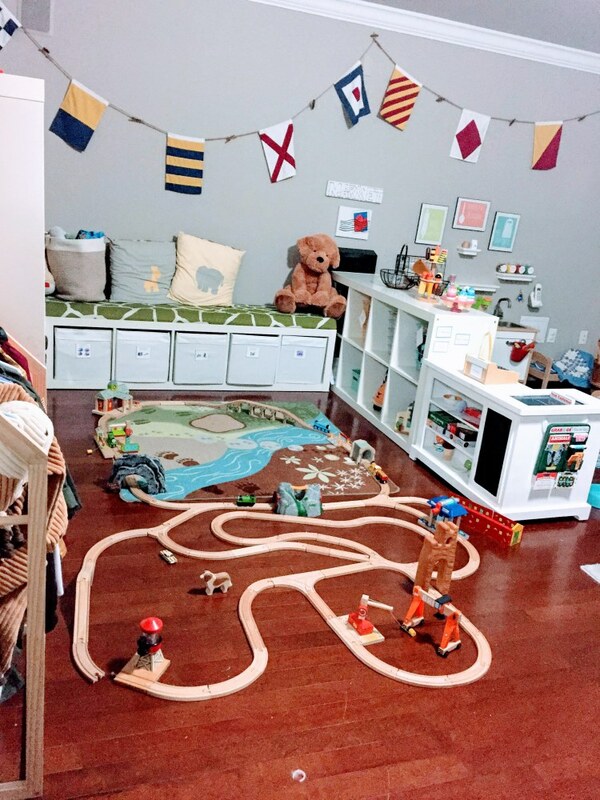 Toys that are set up like train tracks, roads and forts can stay up for one night and then they have to be put away. The boys love to save their creations but I find they don’t play with them as much the second day. I also like everything to be tidy at the end of the day. This post contains affiliate links. 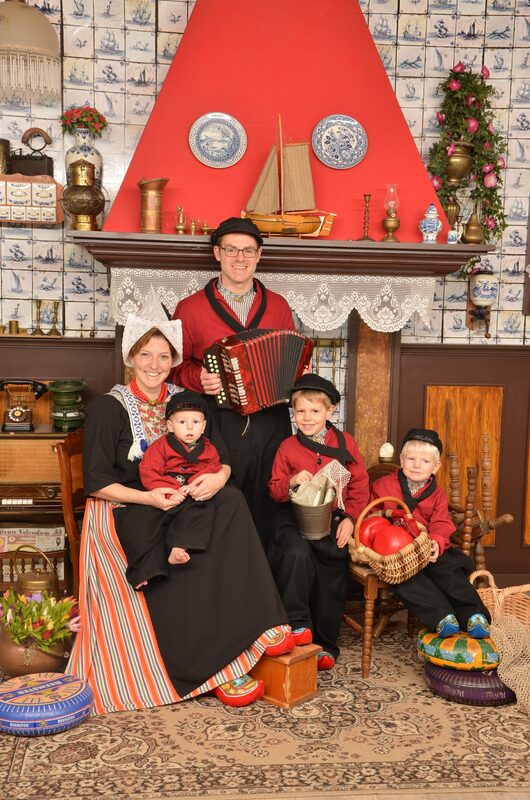 Purchasing through one of my links provides a small payment to Dutch, Dutch, Goose! at no cost to you. We only recommend products that we have used. I was provided the hideaway mounts and Guardian lock at no cost for the purpose of this review.